At various times the story of the Coiners has appeared in a variety of forms of media including books, poems, songs, plays, exam papers and there are now plans to turn the story into a movie for the cinema. This page describes the media I have come across that refers specifically to the Yorkshire Coiners. It is by no means exhaustive and there are possibly other pieces out there that I don't know about. If you know of a media item that is not included on this page I would be very interested to hear about it. Please let me know by using the contact link on this website. A number of books and booklets have been published on the subject of the Yorkshire Coiners at various times. These are detailed below. Henry Ling Roth was an English-born anthropologist, active in Australia. He was educated at University College School, London, and studied natural science and philosophy in Germany. He produced a number of notes, reports and papers relating to Agriculture in Russia and Australia and on the Aboriginal Race in Tasmania and the Natives of Sarawak and North Borneo. Then in June 1900, Ling Roth was appointed honorary curator of the Bankfield Museum, Halifax, which was in a rather neglected condition at the time. Ling Roth soon changed this, and in 1912 was appointed half-time keeper and later on he became full time to the museum. In January 1906 Ling Roth was presented with a series of notes made by Francis Alexander Leyland, a local historian, by the historian’s son John. Leyland had given a lecture on the subject of the Cragg Vale Coiners in 1886 after studying the papers of the Halifax Solicitor Robert Parker. Having studied Leyland’s notes and the papers from Parker that were enclosed with the notes, Ling Roth published “The Yorkshire Coiners, 1767-1783, and Notes on Old and Prehistoric Halifax” later in 1906. The first section of Ling Roth’s book gives an account, using extracts from the newspapers and letters of the time, of the rise and fall of not just the local Cragg Vale Coiners, but some of the other Coiners elsewhere in Yorkshire. It contains descriptions of people suspected of coining and murder, and includes transcriptions of newspaper reports, witness statements, trial papers and details of sentencing which in some cases was execution. This part of the book also discusses the state of the coinage and currency of the time and the government’s policy towards “clipping” and “coining”. Ling Roth's book has generally been considered the most accurate portrayal of the Coiners written as it transcribes several of the original documents contained in Leyland's papers. Whilst the book does contain most of the facts and details required, it is often difficult to follow the story due to the fact that the particulars are not always presented in sequence and the distinction between the various documents and Ling Roth’s commentary is not always apparent. Some of the key information is also contained within footnotes rather than the body of the text. Some of the documentation referred to can be difficult to understand due to the language and expressions used at the time they were written and there is little in the way of explanation throughout. John Marsh was born in Halifax in 1907 and attended Giggleswick School between 1922 and 1924. His early writing career consisted of historical romances using a number of pseudonyms. In all he wrote about 140 novels, mainly thrillers. In 1955 his greatest success, The Young Winston Churchill, was published and sold over 300,000 copies in the UK and the US. First published in 1971, Clip a Bright Guinea does arrange the facts in order better than Ling Roth’s book, but is not as comprehensive and it does not include as many transcriptions from actual documents. The preface to the 1990 edition pictured on the left indicates that the sources used in preparing the book had been the Calderdale archives, Library of H.M. Customs and Excise, Library of the Royal Mint and Leeds Public Libraries. In some instances the author only speculates as to what might have happened, perhaps introducing an element of fantasy and fiction to the gaps in the story. This is perhaps due to Marsh's more regular career as a writer of fiction. Phyllis Bentley was the youngest child of a mill owner, and grew up in Halifax. She was educated at Halifax High School for Girls and Cheltenham Ladies' College. During World War I she worked in the munitions industry. After the war, she returned to her native Halifax where she taught English and Latin. In 1918 she published her first work, a collection of short stories entitled The World's Bane, after which she published several poor-selling novels until the publication in March 1932 of her best-known work, Inheritance, set against the background of the development of the textile industry in the West Riding, which received widespread critical acclaim and ran through twenty-three impressions by 1946, making her the first successful English regional novelist since Thomas Hardy. Two further novels followed in 1946 and 1966, forming a trilogy, and in 1967 Inheritance was filmed by Granada TV, with John Thaw and James Bolam in leading roles. 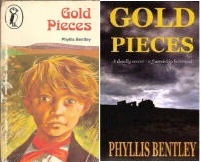 In 1968 she wrote the children's novel Gold Pieces which is a fictionalised account, seen through the eyes of a twelve-year-old boy, of the Cragg Coiners. The original 1968 edition is pictured on the far left with a more recent edition published in 2007. This book was my first encounter with the Coiners in written form and was a book that I read as a child. 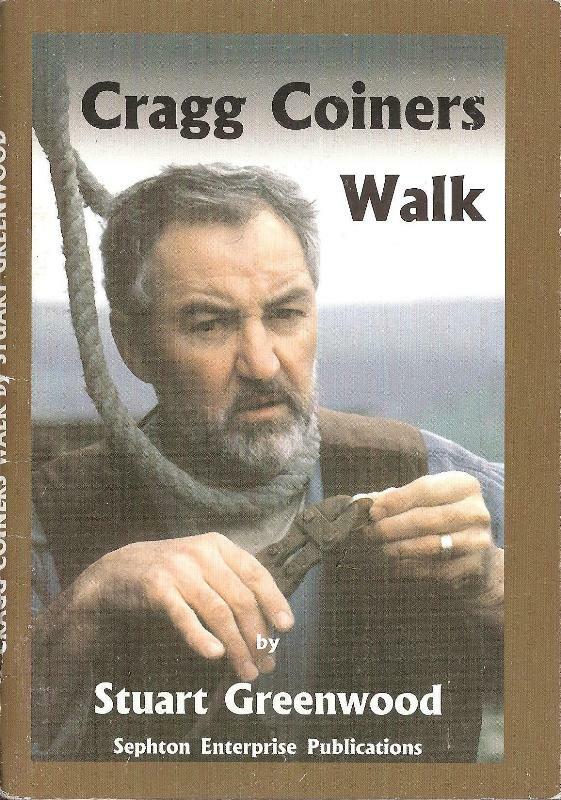 Whilst the story itself is based around a fictional character, the book accurately portrays the story of the Coiners and is clearly based around the actual events. Several actual Coiners and authority figures are mentioned, including David and Isaac Hartley, William Chamberlayne and William Dighton. This book brings together a number of essays which examine the lawlessness of the seventeenth and eighteenth century Englishmen. It was edited by John Brewer, a Professor of History at Harvard University and John Styles, a Lecturer in History at the University of Bath at the time. Each of the essays in the book examines a different source of conflict, including village regulation, the price and shipment of grain, the building of turnpike roads, imprisonment of debtors, and the circulation of counterfeit coin. Styles himself wrote the essay entitled Our Traitorous Money Makers : The Yorkshire Coiners and the Law 1760-83 which is included in the book. The essay looks at the economic circumstances that enabled the Coiners trade to flourish and the lack of Government action to address the problem of light coins in circulation. Also examined is the role of the Solicitor of the Mint who was expected to carry out prosecutions against Coiners in the country on an annual budget which was regularly exceeded, but for which there was no statutory obligation for the Government to fund the excess expenditure, resulting in the predecessor to William Chamberlayne declaring himself bankrupt. Unlike the two books mentioned above, the source of the data on which the very detailed essay was based was the full range of archive material held in the Public Records Office (now the National Archives) and the Sheffield Archives, rather than just the limited information contained in the Halifax Archives. This booklet by Bruce Holdsworth B.Ed., M.A. and published locally in Hebden Bridge, gives a brief account of coining in Yorkshire from the year 1500 up to the hanging of Thomas Spencer and Mark Sattonstall in 1783 and the death of Isaac Hartley in 1815. It uses the content of the Ling Roth book as the primary source of information and includes several photographs of sites associated with the Coiners, coining tools and coin scales. A number of illustrations are also included and the booklet chronicles the events of the Coiners story. Stuart Greenwood was born and bred in Wadsworth and in 1980 moved the short distance to Cragg Vale. After serving on the Hebden Royd Town Council for several years representing Cragg Vale, he was elected as Mayor on 1997. As part of the fund raising activities for his Mayors charity fund he organised a walk which would cover many of the properties and the countryside that had been home to the Coiners. Funds raised from the walk and the sale of the book were to be donated to Roof Over Youth Development (ROYD) to assist in providing facilities for the young of Mytholmroyd and Cragg Vale. The booklet, although brief, tells the story very well and whilst it does not include detailed transcriptions it does contain many of the facts. Indeed it is the only source I have seen that correctly notes that the Dusty Miller did not exist at the time of the Coiners and that the Coiners met at Barbary's. The route of the walk is also described, starting at Mytholmroyd Community Centre and making its way up through Cragg Vale to Erringden, past Hill Top Farm, High Greens, Crumber Hill and Keelham before arriving finally at Bell House. The route then descends back down to the valley floor passing New House and Hall Bank and returning to the start point. This booklet was published by the Calderdale Amenities and Recreation Department in July 1984. I have another copy which I believe is a private copy entitled 'Coins and Coiners' by Colin Spencer which appears to be the basis of the Metropolitan Borough of Calderdale edition. The booklet outlines the events surrounding the Coiners and gives a description of the method of making a coin, including the mechanised methods used by the Mint and the more crude methods employed by the Coiners, with photographs of Coiners dies and of coins made using the dies by Eric Stenhouse. It includes a map of the area and a description of 'Coiners Country'. The Last Coiner - Peter Kershaw/Vince Danks. The Last Coiner is a graphic novel, written by RTS Award winning filmmaker Peter M. Kershaw, with comic book artist Vince Danks. The book was published as a publicity aid to promote the development of the Last Coiner movie project by Duchy Parade Films of Harrogate. The book tells the story of the Coiners in the graphic art form. "King" David Hartley is re-named David Hawksworth. Its production featured actors, including Keith Patrick as David Hawksworth, photographed against blue screen, forming a basis for the digitized artwork. As a dualistic creative process, both docu-drama filming and photography were directed in tandem. The still images were then digitally manipulated using a technique referenced as photo realist art, and ultimately designed to facilite narrative sequence storytelling as seen in comic books and newspaper strips. A documentary was subsequently shown at the Hebden Bridge Picture House. A series of workshops were organised by Peter Kershaw to examine aspects of the coiners story to help prepare the production of a full length feature film which is hopefully still in the pipeline. The tale of the Yorkshire Coiners has also appeared in a number of songs and poems at various times and those that I have become aware of are detailed below. This track was contained on the 1992 album 'Shhh' by the anarchist punk band Chumbawamba. The track can be heard on YouTube, HERE. High up in the Pennines above the village of Cragg Vale lives a hill farm poet called Ian King. Early experiences on his dad’s farm were hard, but Ian picked up many traditional skills on the way such as walling, tree planting, and shovelling! Above all, Ian learnt the arts of patience and hard graft. Soon he started to write about his life on those wind-swept hills, and as he delved into local history he found out about many kindred spirits who used to scrape a living from that unforgiving land. As his talent with the pen began to match his renown with the shovel, Ian gained in confidence and began to sing of deeds glorious, inglorious and downright humorous in the local taverns thereabouts. Soon he gathered a reputation as ‘the hill farm poet from up Cragg’. But he was also gaining a reputation as ‘shedman’, due to the fact that he now lived in a shed on his very own farm. Over the years Ian slowly built up a collection of songs and poems which he began to perform with local musicians. After many years on the folk scene, Ian decided it was time to make an album. He teamed up with accomplished Leeds musician Simon Bradley and together they began to work on the material. The work took a couple of years and many different versions of the songs were experimented with until in 1999 the CD Shedrock in the UK was finally released. Shedrock, a distinctly Northern blend of rock, blues and folk, was born. In the same year, Ian had become something of a local celebrity featured on TV, radio and in the national press due to his legendary battle with Calderdale Council. After a Public Inquiry, Calderdale Council were overruled, and he won the right to call his hill farm shed a home. Built from local recycled materials, the shed is now more in keeping with an 18thC farmhouse. Ian has continued to perform his songs to appreciative audiences in Yorkshire as well as internationally. He now enjoys followings in Thailand, the Philippines, Sowerby Bridge, and Edinburgh… the list grows! In 2008 Ian decided that it was time to start working on some new material, and he called upon Simon once more. The first of the new tracks, Yorkshire Coiners, was received with glowing praise from the presenters and listeners alike on Phoenix Radio, 96.7 FM. The poem tells the story of the Coiners with a humorous slant from 'King ' David Hartley's return from the midlands, through to his arrival in Heaven following his execution. It is written in a distinct Yorkshire dialect which becomes even more apparent when listened to in Ian's audio version which can be heard on his website HERE. Steve Tilston was born in Liverpool and raised in the Midlands, and made his recording debut in 1971 with the classic An Acoustic Confusion and has been turning out quality albums ever since. Life by Misadventure, And So It Goes, Solo Rubato and Such and Such all featuring first-class song-writing, quintessentially English in style and typically Tilston, marking him out as one of this country’s finest writers. Whilst the instrumental Swans at Coole is testament to his guitar virtuosity. Though known as a songwriter, Steve has always had an ear for the tradition and included new interpretations of old favourites on his original recordings. Of Many Hands is his first “all-traditional” album paying homage to his roots, with unique arrangements of timeless classics. He’s also released a “best of” anthology, The Greening Wind and a live album Live Hemistry recorded on tour with Fairport Convention. On his 2008 album Ziggurat he deftly weaves his mastery on original songs of love, loss, war and gold, plus a couple of traditional gems, as only he can. His new album The Reckoning is out now. It is on the album Ziggurat that the melancholy track "King of the Coiners" appears, and it describes the journey of David Hartley's funeral procession along the road from Halifax and up the hill to Heptonstall, referring to a "Strange kind of chariot rumbles up the hill". The track goes on to describe the activities of the Coiners, and their struggles to make a living by lawful means. Dighton's murder is also mentioned and the resulting outcry far away in London which resulted in the authorities tracking down, prosecuting, and in some cases executing the Coiners, in particular David Hartley; the King of the Coiners. An extract of the "King of the Coiners" can be heard on Steve's website HERE. At times, the tale of the Yorkshire Coiners has also been the subject of plays and performances by local groups and is in the process of being developed into a movie for cinema. I have detailed below some of the performances I am aware of together with details of the exciting new movie project. Calder High School was Yorkshires first ever comprehensive school is now a Specialist Technology College and Training School for the area surrounding Mytholmroyd. It is located immediately behind White Lee, where Isaac Hartley died in 1815. The school opened in May 1952, replacing the older Hebden Bridge Grammar School and amongst others it can boast pupils such as Rugby League player Stuart Fielden, actors Dario Coates (Alex Neeson, Coronation Street), Thomas Nelstrop (The Impressions Show, Hotel Trubble, Doctors, Two Pints of Lager, and others) and Jessica Harris (The Inbetweeners, Being Human, Wire in the Blood, The Royal, Heartbeat, and several others). My father also attended the school in the late 1950's but at the time didn't realise how close he passed to the home of our infamous ancestor as he made his way to and from school each day. One of the teachers in my Fathers day was Eric Stenhouse who took an avid interest in the Coiners, and it was Mr Stenhouse who was instrumental in this production providing advice and information on which the play was based. The picture above shows the cover of the programme produced at the time, of which I have an original copy passed on to me after my Grandfathers death. I'd be very interested to hear from anyone that played a part in the production or anyone who might have a copy of the script. I've no doubt that the school has probably revisited the play since the time and would again be interested to hear from anyone that can let me know about subsequent productions. Written by Geoff Scott in December 2004, the play was specially commissioned for the Heptonstall Festival and was first performed at the Festival on September 10th 2005. The festival was held in Weavers Square and included a number of performances from local artists and groups. The Last Coiner - Peter Kershaw. 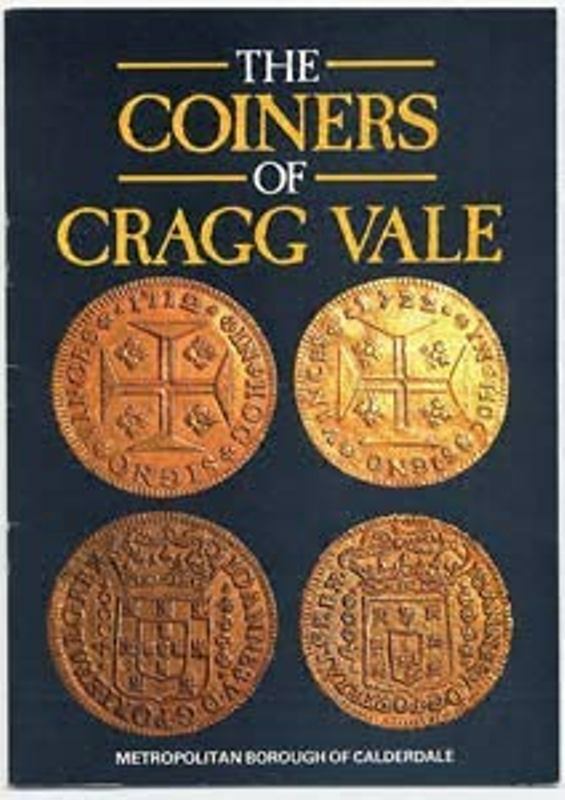 The tale of the Cragg Vale Coiners is currently the subject of a project to produce a new feature film entitled “The Last Coiner” which is inspired by the events surrounding the gang. The man behind the project is Peter Kershaw, writer, director and producer of Duchy Parade films, now based in New Mexico. In a unique approach to film making, specialists and historians were brought into the project at an early stage to ensure that the script was historically informed and accurate. All too often these experts would only be consulted during production of a film, by which time it is usually too late for their advice to be effective. Through the securing of a grant from the Arts and Humanities Council (AHRC), Peter Kershaw enlisted the support of Dr Hannah Greig, a lecturer in 18th-century British history and Dr Nick Tosney, Postdoctoral Research Assistant, both of the University of York History Department. The grant then funded a series of five workshops during October and November 2009; the first four in Halifax and the final one at the York Castle. These brought together scholars and experts from various fields, local historians and other interested parties to discuss the lives of the Coiners and the influences behind their coining activities.